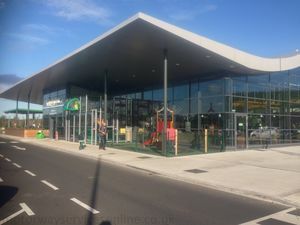 A brand new motorway service area opened on Northern Ireland's M1, now available on both sides of the road. The opening of the services has given Applegreen a monopoly on motorway services between Belfast and Dublin. In planning this one was referred to as 'M1 services', which can be confused with a petrol station on the A4 which pre-dated Northern Irish motorway services. Some sources (incorrectly) call this service area Ballyskeagh. The design is very similar to what Applegreen have been using in the Republic of Ireland, especially on the northbound side. The southbound side has a second-storey coffee lounge making it very similar to its sister site at Templepatrick. The biggest difference is from the outside: the Northern Irish services have much less green space. Applegreen are taking over Welcome Break, with plans to apply the name to more "UK sites". It's not clear whether this means Lisburn will receive Welcome Break branding, and possibly some of their brands.